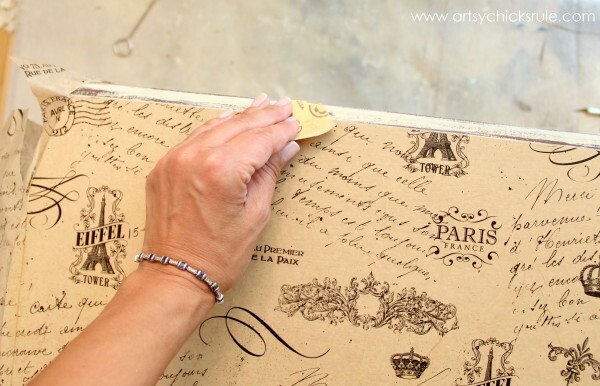 Learn how to French paper decoupage….with tissue paper! It’s simple and gives a great look! Every month a few of my blogger friends and I get together and create a makeover around our chosen theme. This month’s theme is DECOUPAGE. 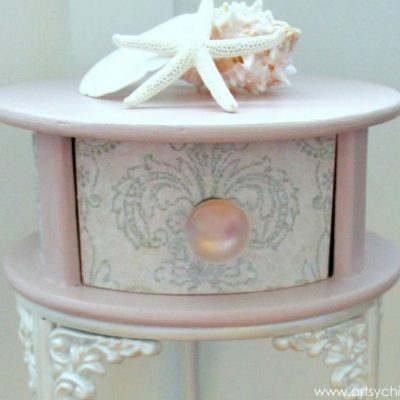 I love decoupage and have done a few other projects with it. 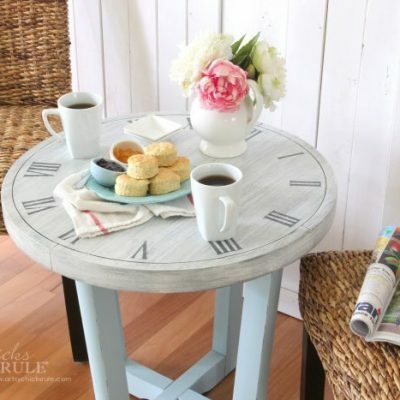 This Butterfly Decoupaged Table , “Vintage” French Fruit Tray, Decoupaged Soup Cans and this OBX Latitude & Longitude Table. For this one, I decided to do a French Paper Decoupage. I paid FIVE dollars for this little table. Well, $5.25 to be exact. I guess someone decided they didn’t like them and removed them before it made it’s way to me? Oh well, it’s a super cute table anyway. But missing side pieces did require me to do a bit of work to it though. I started out by sanding the top lightly so none of the imperfections would show through the paper. I used wood filler on the outside to make it seamless. I had originally planned to paint the sides but really wanted those curves on the bottom to stand out. I felt like they’d get lost if I just painted them all one color. 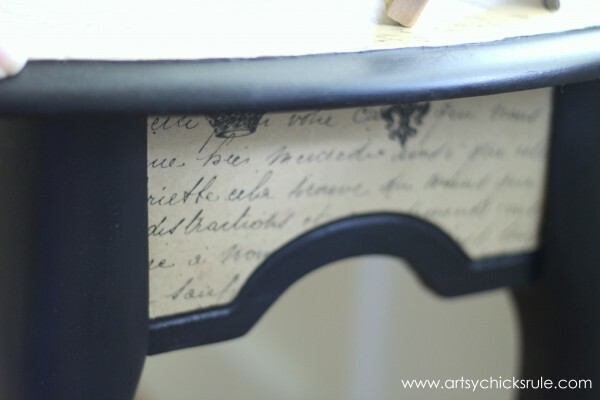 To begin, I painted the top a light color similar to the paper….Old Ochre Chalk Paint. 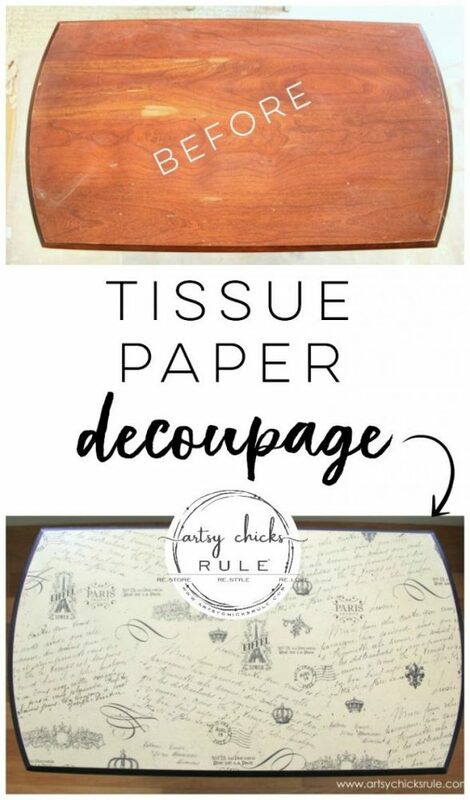 Did you know you could decoupage with tissue paper?? I wanted something really thin and found this paper at Michael’s. 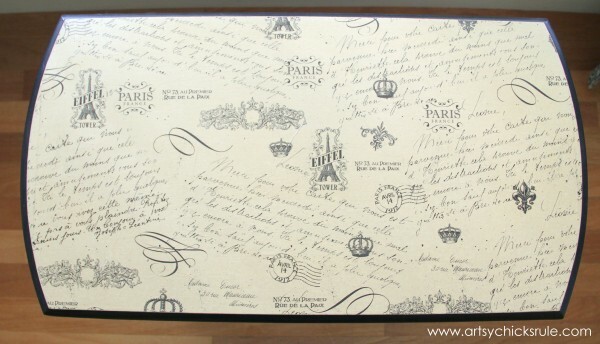 It’s very delicate so a lot of care had to be taken so as not to tear or rip this French paper decoupage when applying. Using a brush, layer a good amount over the entire top so it won’t dry too quickly when laying the paper down. I used my little squeegee thingy to oh-so-very lightly press it onto the top. The paper was about an inch too short. Darn. …but it actually worked out much better than I thought it would. The paper is so thin it ended up with “wrinkles” and I LOVE them! They are perfect for the whole look I was going for here. That’s so much fun when that happens. A project does something unexpected and you end up loving the effect! You can see them really well in the photo below. Once it was dry, I used a piece of very fine sandpaper and lightly rubbed along the edge to trim the excess. It came right off! So easy. For the sides I had to use an x-acto knife but that worked pretty easily too since I had a good edge to run along. For the legs I had originally planned to used Graphite Chalk Paint but it was not black enough. I remembered I’d bought some Lamp Black awhile back. I’d never used it but knew it was a true black color. Perfect! That black is just fabulous….so smooth in application and afterwards. I very much loved working with it. I painted another little table with from the same paint line awhile back and will definitely be picking up some more to try now. For the top and sides (decoupaged areas) I put 2 coats (drying well in between) of Minwax Polycrylic. 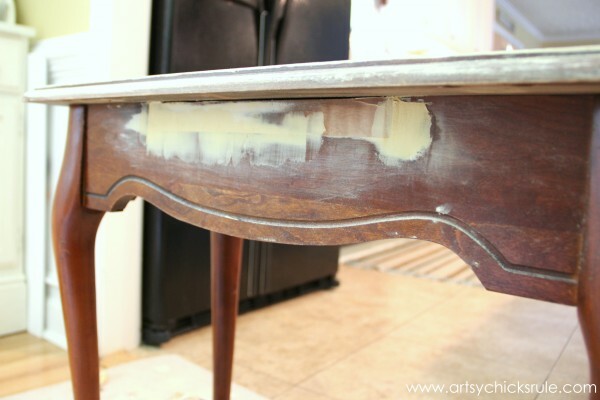 Once the polycrylic and black paint was dry I applied one coat of Annie Sloan Clear Wax over the entire thing. Buffed it up …and done! 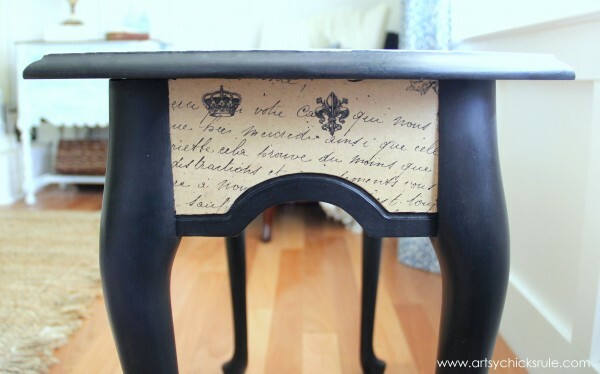 What a difference a little French paper decoupage and paint makes, right? You know it’s a winner when your husband walks in at the end of the day and says it’s “the bomb”. 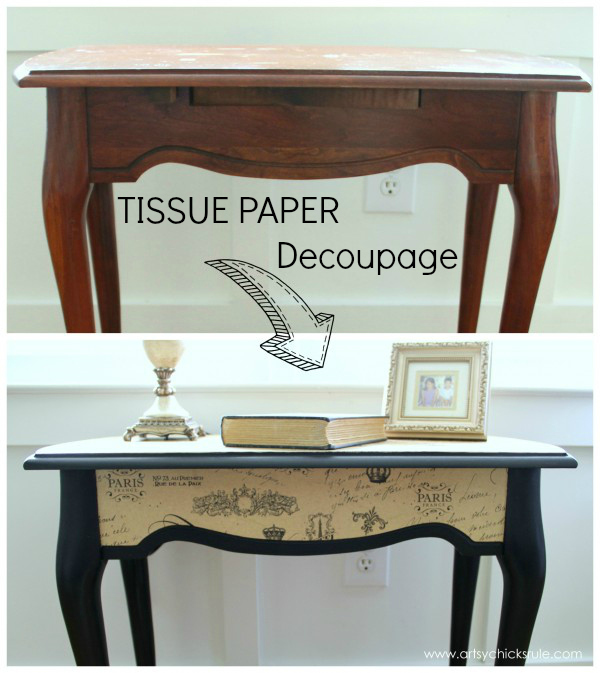 Guess what….there are even more decoupage furniture makeovers for you down below. Be sure to check back later this week to see what I did to this! Not only is that a great upgrade, but it would be perfect in my living room! Cool! I have a question about ascp Old Ochre. I bought some a while back, expecting the colour I see on your table… but when I tried it out, it turned out to be a cool shade somewhere between damp and dry grey potter’s clay! Is that crazy, or is your experience with Old Ochre similar to mine, and the table’s colour was changed by the tissue paper? If you can tell me, I’d really appreciate it! Thanks!!! :) I would say that’s pretty accurate description of the color. 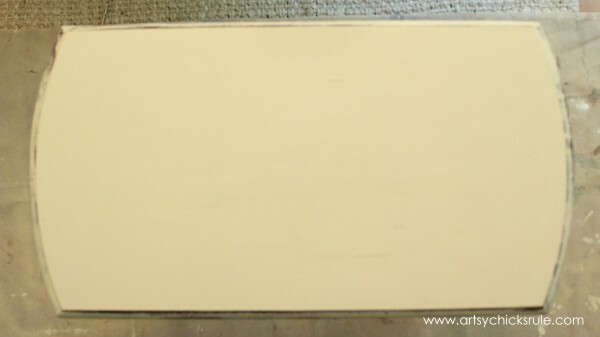 It’s sort of an off white color with more of a “putty” tinge to it. The tissue paper is so thin that I wanted a light (but not white) background. The tissue paper looks about like it does by itself over the Old Ochre..maybe a bit brighter. Love this! 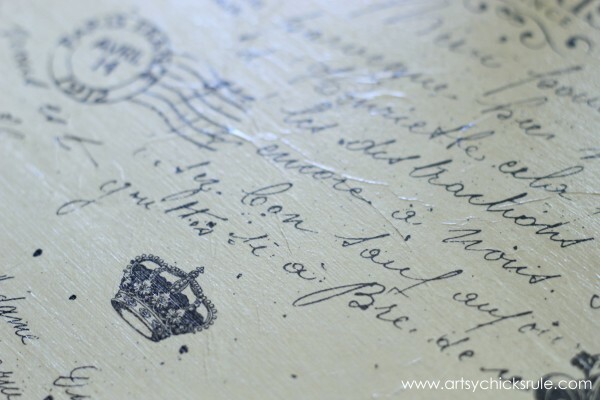 I really like the “imperfection” of the wrinkled paper! Now I want to try the General Finishes paint! I didn’t originally intend for it to be wrinkled but love that it naturally wanted to do that. Getting them out would have been impossible, I’d have ripped it all up! ;) So, it was one of those happy accidents!! I just love those! And yes, definitely give the GF a try! 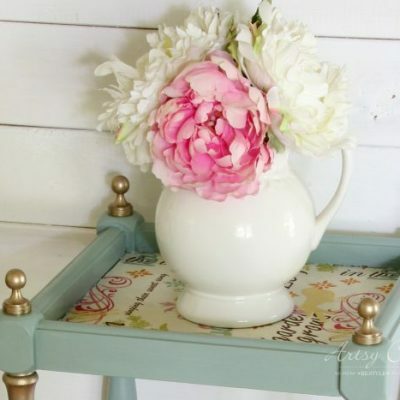 What a beautiful table – I love following your blog, you always have great ideas. Thank you so much! :) And thank you for taking the time to comment and the sweet words too. Girl you really hit the nail on the head with this project! Gorgeous!! One of my favorite pieces to date. How different is working with milk over chalk paints? I have some but haven’t tried it yet. Your husband was right. It is “the bomb”. What a beautiful table. It looks more like a designer piece than a thirfted piece. Great job, as usual! I found it at Michael’s actually. :) Yep, the Mod Podge goes under the paper. Love the tissue paper effect. I think the wrinkles add something. 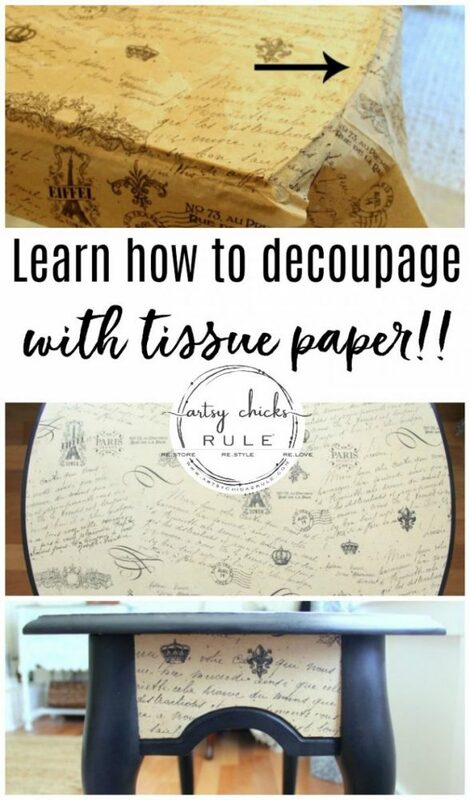 Wondering if some printed tissues would lend themselves to tearing before decoupaging? Thanks for sharing your creativity. . .beautiful. Yes, this was very thin paper so I had to take great care when applying it. I think if you go in with that in mind, and keep a very light hand, should be able to use any paper! Fabulous! One of my favorite pieces you have done! This is fabulous! It looks like something you would totally buy from a high end shop! You must have been reading my thoughts! I was searching for a decoupage tutorial, and then it linked here! I heard you can do it with all sorts of materials. I need a really sturdy material with hard finish on top (polycryclic). I saw someone did fabric, someone paper and now you did tissue paper. Does it matter as far as durability? And is basically modgepodge on the bottom and then on the top? Oh awesome!! Yep, you can certainly use fabric too! I would think a wallpaper would give a nice hard finish. Although, once done and sealed (more coats for better durability) any paper, even tissue, should be very durable. I used Mod Podge under and Polycrylic on the top of this one. Two coats. It’s finish is hard and durable. I also put a layer of clear wax over that for extra protection. Wow! This piece is AMAZING!!! I don’t know why but I envision a fancy black tassel hanging on the front. I have a neighbor who loves Paris, she may want to do something like this, I will pass it on to her. 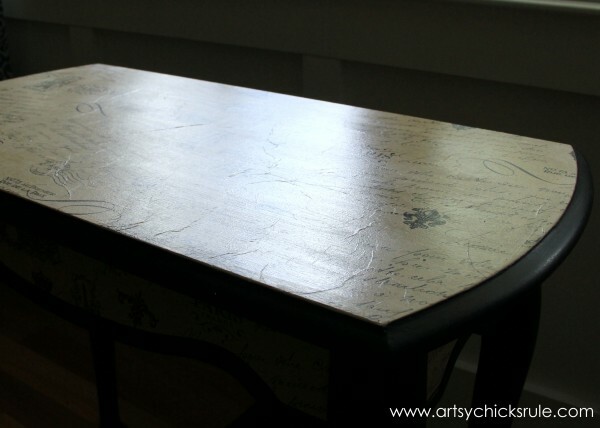 I have a table very similar to this one, I think I will decoupage it in a similar way. Now the hard part-deciding on what paper to use! Thank you!! Ohhh, I just envisioned it when I read that and YES, I can so see that! It is gorgeous! I was thinking about you the whole time I redid Denver’s old dresser. 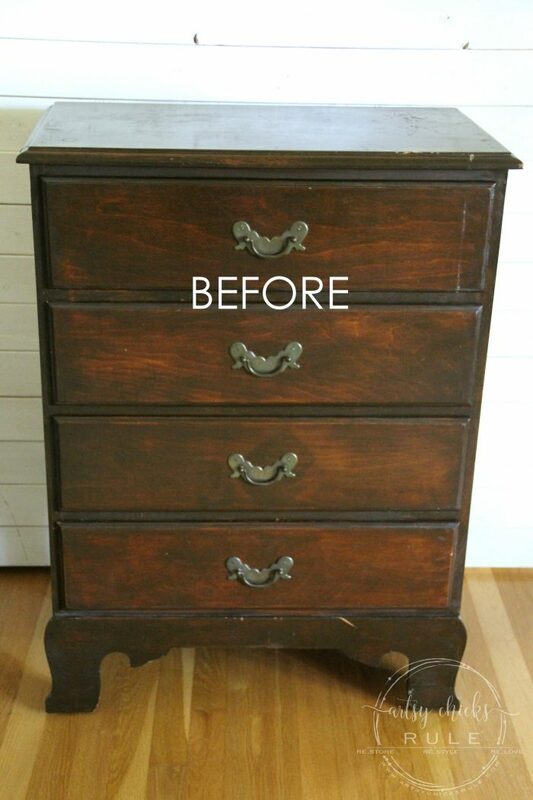 It’s from a set that his grandfather bought him when he was first born (he did NOT want to take it to his college apartment since it looked “Victorian” (it was the handles), but once he got there he realized he needed a dresser. So I came home and used glossy black spray paint over everything except the drawers. I pulled them and then decopauged torn up pieces of sheet music, books, and magazines to the fronts. I also spray painted the gold handles black and they would have looked fabulous on it, but he opted not to have me reattach them. It’s all black and white and very modern looking now and he really liked it. I failed to take a photo of the after, but you’d be proud of me! I need to get a pic next time I’m up there. You know I think I remember a tray (was it blue/ of course it was), but I forgot that I had given you those inboxes. How does one search your site so I can go back and look? Do I just have to scroll and click a lot? Your table looks delightful. I like the idea of tissue paper and the wrinkles. It looks amazing. Great makeover, my friend. Oh, Nancy! I love it! That little table has to be one of my favorites of all the beautiful pieces you have done! And that’s saying a lot, because your creativity and ability never ceases to amaze me! I’m partial to black, so this one really “speaks” to me! Excited!! It’s so different from most of the things on my blog…gonna go a little out of my usual on future projects with color I think! It’s fun! 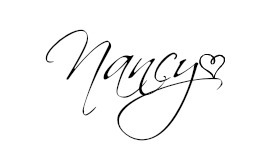 This is gorgeous Nancy! I’ve never watered Mod Podge down…thanks for the tip. I’m pinning! You and I must share a brain girl! I have some tissue paper almost identical to that I am getting ready to put on a black dresser. I wasn’t sure how the whole tissue paper this was going to work but you showed me it does! I love that it’s crinkled! This looks absolutely beautiful! Oh fun and thank you Shanna!! :) I love decoupage with tissue paper!! Can’t wait to see yours! The tissue paper looks great on this table. Like the other comments, I like the wrinkled effect! I also use my Pampered Chef scraper out of the kitchen! I love this table. 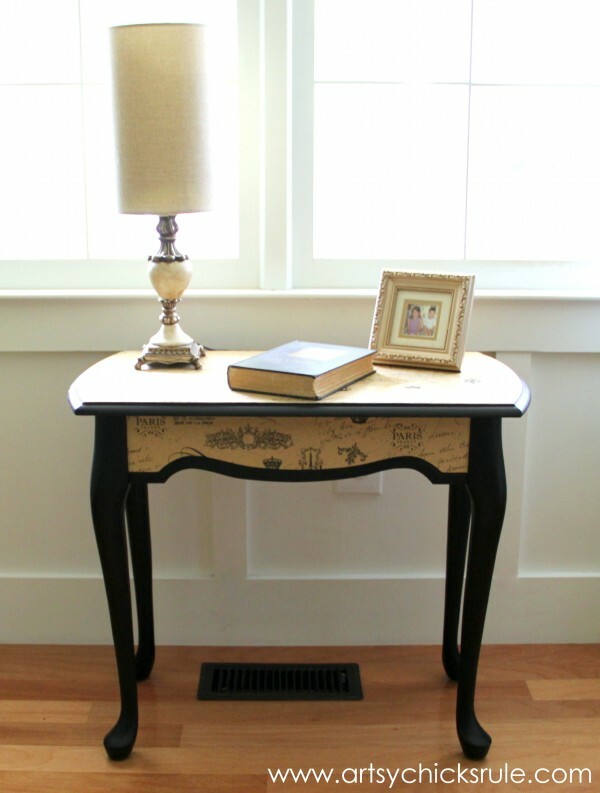 This must truly be the month for decoupage, because I posted my latest decoupage piece and some inspiration pieces on my blog Lisa S Nance Furniture ReDesign just a few days ago. It’s amazing what you can do with paper and paste! Great job!! Thanks so much!! I do love decoupage and all the design possibilities with it! Love this Nancy. It’s so amazing that a five dollar table is now a beautiful french piece of art! Ooh La La!!! I love that you used your Pampered Chef scraper to smooth out the paper. Brilliant! It looks great Nancy! OK…I’m kinda in love with this makeover. It is the tissue paper that makes it “the BOMB”. Wow! As always you knocked it out of the ballpark!! This is beautiful. love your paper choice too. Funny..I think I hve that table too..Just picked it up and it still has the sides on it . You’ve inspired me on your design! Thanks Wendi! :) Oh so funny! Must have been a popular table!! Can’t wait to see what you do with yours! 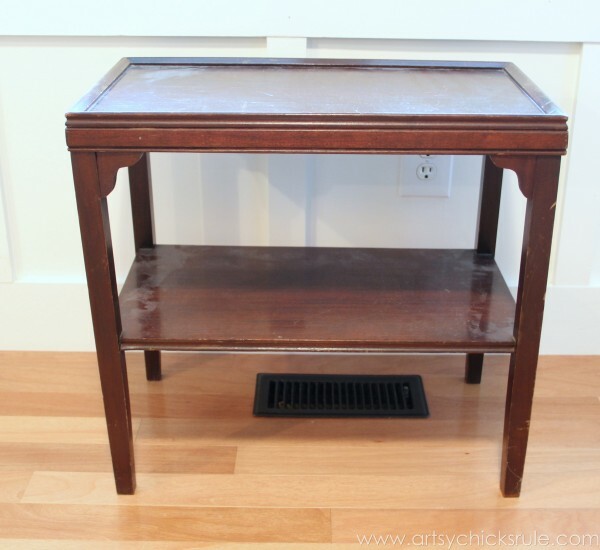 Perfect little table Nancy. I like the black with the paper you chose. You did a really great job considering that it’s tissue paper. Regular paper is hard enough to work with without tearing. Beautiful! Thanks Kathy!! I know, you are so right, I had to have a VERY light hand! But I do love the effect! Absolutely beautiful!! I love the decoupage on the table!! Beautiful!! Hi, I just love this and I hope that I can find this paper at our Michael’s in Canada. I love getting inspired by your posts! Hi- The table came out absolutely beautiful! I’m wondering why you applied wax OVER the polycrylic? I sometimes do that to “soften” the look of the polycrylic or add color as in dark wax. This time I did it to add a third layer of protection AND to match it up to the rest of the table since I was applying the wax to the black areas. Oh now that is just fantastic! I have used white gift wrapping tissue paper on imperfect walls to create a wrinkled texture look. Once painted over it is the same color as the wall just textured. 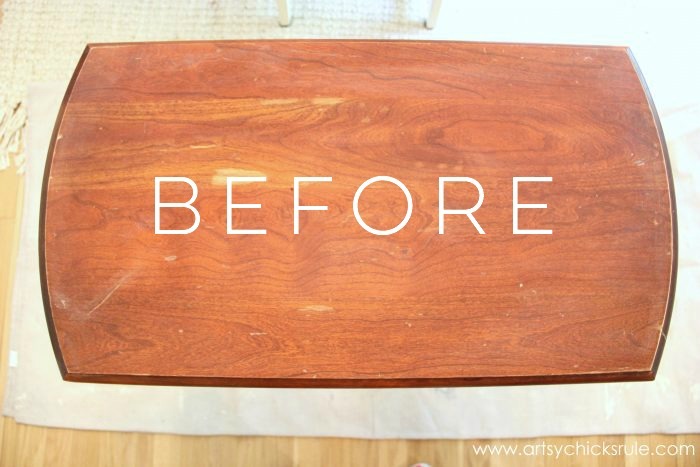 And I did this on a piece of furniture too. But I love what you did here! The tissue paper with a design opens up a whole new kind of fun! Really a great makeover! 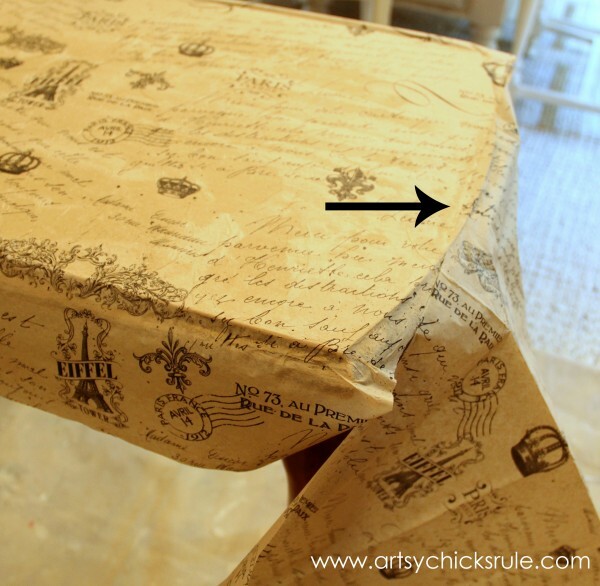 And…what a neat idea to add tissue paper for the sole purpose of the texture! Love that idea. This is beautiful!!!! 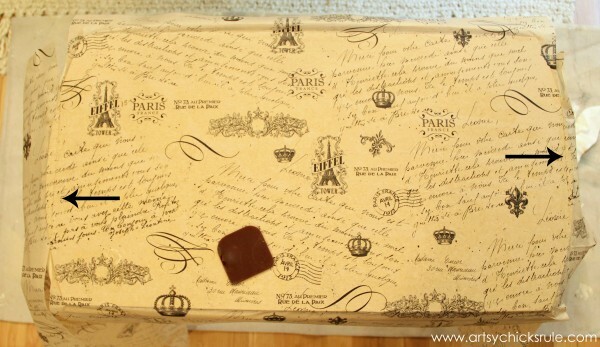 I swear I had to look up decoupage…and I even took French lessons for what felt like forever. I would be so intimidated. It’s gorgeous! Lovely Love letters from Paris! That’s what I thought the second when I saw those perfect wrinkles in the tissue papered top! Amazed at how you made your 5 buck chuck look like an fine Parisian wine, Nancy. I love it!!! 5 buck chuck to fine Parisian wine…so funny!! I’m loving that black and want to do more! This is simply gorgeous. I’ve never tried decoupage, but I’m now inspired. 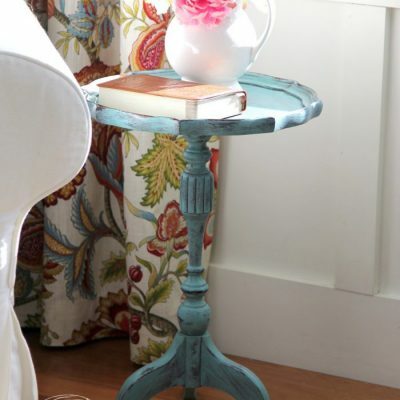 I have a little table that I was thinking of silver leafing, but now I’m torn. I might have to do this instead. Thanks for the inspiration! I have an old fashioned coffee table and end table set that I have been anxious to change up. This is exactly what I’ve been looking for! I love that you gave us step by step instructions and I love the idea of tissue paper! I’m going to try it and I’ll let you know how it comes out! Thanks so much for the great idea! Thanks so much and good luck with your project! :) I’d love to see it when it’s finished! You did an amazing job! I have just the right piece of furniture to try this technique myself!? Thank you for clear instructions and so many great pictures too! Thank you Kim! :) Have fun! I don’t care how long ago it was that you did this make over, it’s absolutely stunning ! Have you done any others since this one that even compare? I would love to see them. Adorable table. I’ve never used Mod Podge before., but now I think I have to. This looks as good as the day you first posted it. Oh, wait. :-) Such a pretty table! Great work, and love the black color! So pretty! You’ve inspired me to do another decoupage project, they are so satisfying and fun! Someone else may have mentioned this (I know someone mentioned a tassel), but I think a pretty vintage drawer pull of some kind would be gorgeous on the front decoupaged area, but it’s also beautiful just as it is! I’m new to your blog and really enjoy your projects? 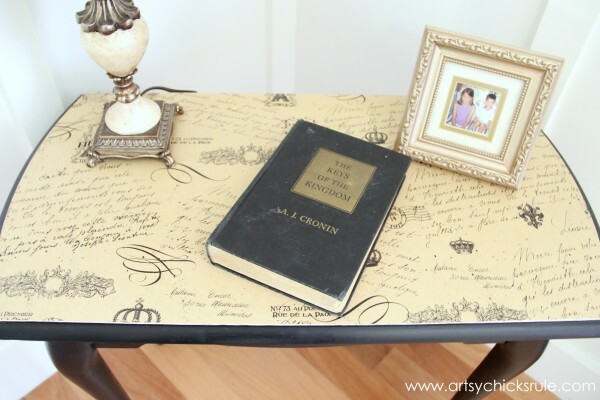 I used your tutorial several years ago to decoupage a French tissue paper to a tabletop, then again recently to pretty up a clipboard, just because. Your instructions are perfect and I used the way you added tissue paper to the ends as a way to patch a tear. You can’t even tell I made a patch! Phenomenal! Both of my projects came out gorgeous and the wrinkles add so much character. I loved your tutorial when you first published it, and love it still nearly 4 years later. Thank you!